Bio: Juan Cristobal Pinochet Araya was born in Linares, Chile in 1960. His mother was Silvia Araya, painter, his father Jorge Pinochet, accountant, art critic and art dealer. Settled in Quebec since 1977, he has made a career as an artist and teacher. He did his classical studies at the Petit Séminaire, Quebec and the University of Ottawa. He was interested in painting from an early age, a fixture at his mother’s art academy. He was a regular at the Portrait Artists of Old Quebec over ten summers, turning out portraits in pastel each summer, with regular life sessions. 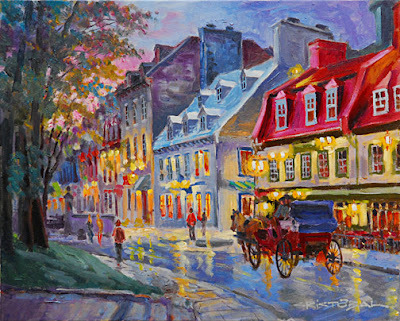 In 1990 he moved to Montreal and in 1994 to Boucherville, on the south bank of Montreal, to found the Silvia Araya Painting and Drawing Academy. He continued his studies on composition, and took the opportunity to participate in master classes with David Leffel. In December 2003 he was chosen as the guest of honor at the International Exhibition Art du Pastel en France, when he was bestowed with the Gold Medal of the City of Yvetôt, France. He has received the Certificate of Merit of the House of Commons of the Parliament Federal Ottawa. 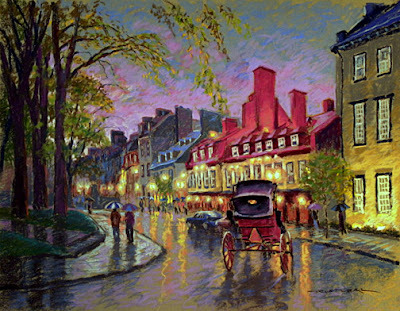 He has been eight times awards recipient from Pastel Society of Eastern Canada. Juan Cristobal is a signatory member of the Institute of Figurative Arts (IAF) and Master Pastellist, the Pastel Society of Eastern Canada (PSEC); he is currently director of the Academies Cristobal colleges of art in Boucherville, Quebec City, and Charlevoix. Navigation: The site is bi-lingual, in French and in English. Navigation is clear enough, except the galleries are to be found under the main links: Biography, and Works Available. The site does not seem to have been updated since 2008, based on internal evidence. Gallery: Private Collections; Subgalleries (all works in oil, except for the Pastels subgallery): Landscapes; Scenes of Life; Cityscapes; Still Life; Portraits; Contemporary; Pastels (12 paintings). Image View: The galleries consist of thumbnails labelled with title, size and medium. Click to enlarge in a pop-up; download is not blocked. I am featuring two paintings because M. Cristobal has painted the same scene in pastel and in oil, so it is nice to be able to make a comparison of treatment and technique. The pastel painting is 18 x 24 ins, that in oil is slightly smaller at 16 x 20 ins. Can you tell which is which?